to toe, another piece to cover a fragment of his hands...but dray still maintained the bandages wrapped around his arms and leather gloves too... On days when he is not anbu, he still puts on his usual version of his shinobi armour as stated earlier above. Nindo: My limit is yet to be met..
be on his head. That's why he is solely bent on making the best out of himself even if it means training all day and all night. Even if it means learning to control his appetite,his mode of sleep, his inner Draygglez and finally, gaining all the knowledge in the world. Other people wonder how a mere human, a mere orphan can gain all the knowledge in the world. But, he made them undastand that when he sets his mind on a track and when he listens to all instructions and learn from both the strong, the weak, the poor, the rich, the wise, the stupid, then, he might actually gain all the knowledge in the world since no knowledge is lost. immeasurrable and can be hardly seprated just as salt water can be hardly seprated from the whole beach. 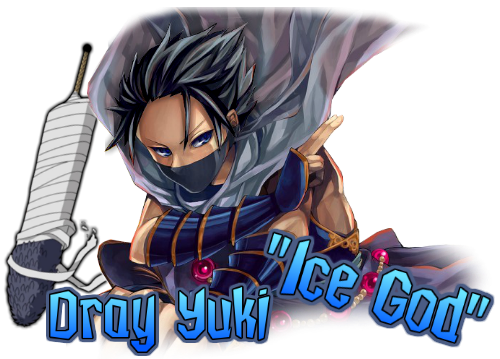 Draygglez, being a member of the Yuki clan has given little reason to why he loves the water so much. Favorites: Dray likes training a lot, sparring with others, building his ability, eating, and mostly, having sometime to himself.. During missions, he likes doing it discreetly as expected of anbu members and he doesn't take failure as an option. Draygglez was born into a small family of the Yuki clan that lived on the outskirts of the village close to large,thick and abundant forests. He was born on the afternoon of the day. After hours of labour,he came through. The moment he was born, the sun began to shine very brightly and the rain poured down really hard as never before. To everybody present at his birth, they were all very aware that Draygglez was no ordinary child. He was a child destined for greatness, success, honour and all other great things of life. As he grew older, he gained knowledge, every minute, he was sharp, bright, agile intelligent and more thrifty than the other children his age. He was always in the water side learning new things about nature,playing with the creatures and as he began to undastand nature,he undastood the world. It happened on a sunny afternoon. Draygglez was resting in the shade of a tree. Eating fresh fruits like apples, mangoes, oranges and bananas which mother nature had given him. He began to dose off when he heard the whining of a lady in the forest. He was puzzled that what could a girl be doing all by herself in the forest. He hurried over. Hopped on trees, ran on foot and he finally got there. The litlle girl about his age was terrified about the spider crawling toward her. Draygglez looked dumbfounded. "How could she be scared of a spider"? He took away the spider and comforted the girl. She said her name was Aimi and they both introduced eachother and since then, they built a friendship bond with eachother. As Dray through life, he learnt to depend solely on himself and believing that he had no limits yet. Key Events: THE CHUNIN EXAMS: After Dray had successfully graduated from the ninja academy with outstanding results. Even though he was now a full genin, his parents died. He felt sad, he felt grieve. The ability of not being able to protect them but that did not change him negatively. He did not stop there. The thought of not being strong enough was always ringing in his head. He went on training his abilities till he was called upon for the chunin exams. He applied for the exams. The first round was pretty tough for him as he could not concentrate well enough due to his parent's death but he made it to the last round. 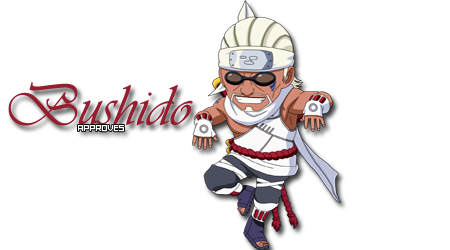 His skill against a puppeteer in the last round so much impressed the kage of his village that after he was promoted to chunin, the kage seperately called him and asked him to join the anbu. Seeing the chance he wanted, he gladly accepted the offer. THE ANBU: life in the anbu was not fair at first as most older members were taunting him about his age but he was well aware that his abilities were extraordinary... As he went on missions and completed them successfully, he felt himself evolve into a new being. More stronger than he was though he still had to deal with killing people. He loved the anbu and the will to protect his village and everything in it. Add more to the appearance, personality and history, ANBU should have at least 1.5k words for history, and appearance / personality at least 500.